When it comes to amazing wine, Europe has it all. While many wine enthusiasts travel to Europe’s idyllic countryside to sip on wines from places like of Bordeaux, La Rioja or Piedmont, we at Zizoo have some different, more boat-friendly, regions in mind. Discover our list of the best wine regions in Europe to visit by boat to get some inspiration for your next boat holiday. 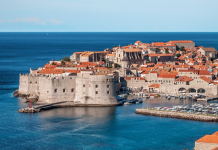 Southern Dalmatia is one of our favourite destinations for island hopping in Europe and a great place to sample some of the best Croatian wines. In addition to their fantastic and award-winning wines, the Dalmatian Islands offer many breathtaking beaches, hidden coves and nature reserves to take a dip and cool down after a tour of sun-drenched vineyards. 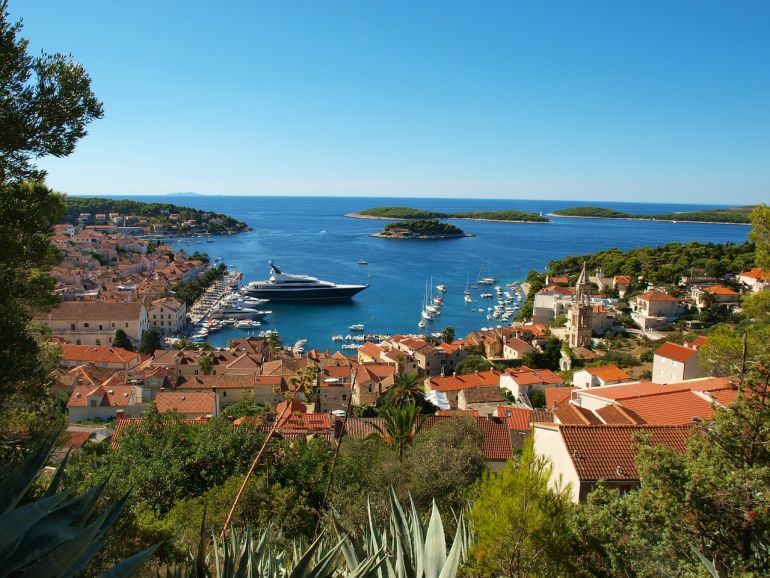 The islands are also home to charming towns, historic sites, great seafood and some of the Mediterranean’s best clubs, making Southern Dalmatia one of the most dynamic wine regions in Europe that you can explore by boat. Book a boat in Split and follow our Sailing Route for Wine Lovers in Dalmatia. 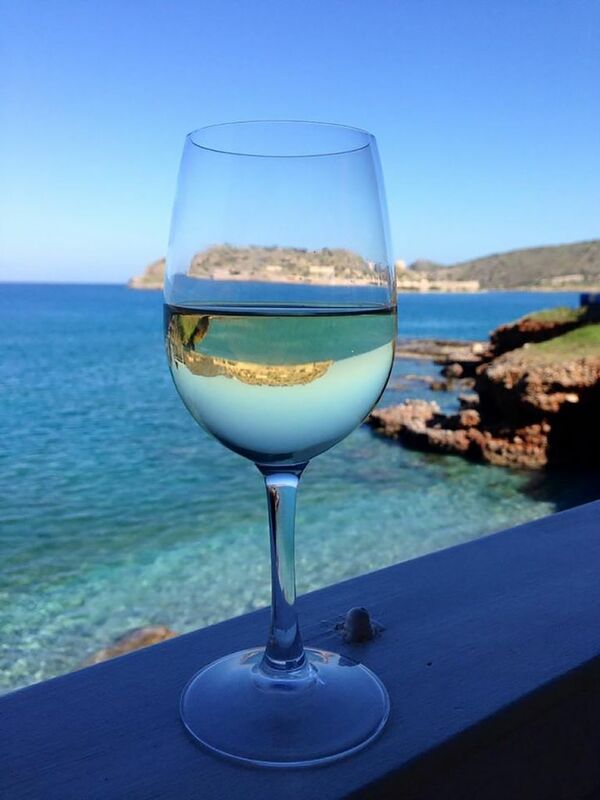 Some people come to Mallorca for the beaches, others come for its wine. Famed for its beaches, vibrant party scene, music festivals and rich culture, the Balearic islands also offer some incredible wines, many of which can only be tried on the islands. Mallorca, for example, boasts over 1200 acres of vineyards and has experienced a major development of high-quality winemaking over the past decade. Many of the vineyards are located in the centre of the island, but it’s definitely worth cruising the coast. We suggest you start at Bodegues Bordoy, in the south of Mallorca. Or extend your charter holiday and explore the rest of the Balearic Islands and their many great vineyards. 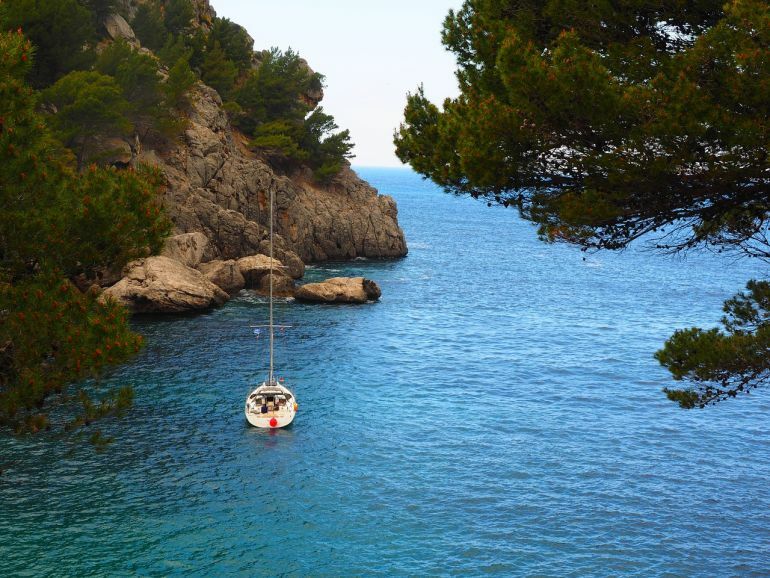 Learn more about sailing in the Balearic Islands. Can’t beat views like this. As the birthplace of the first European civilization, Crete’s history, rich culture, and wines are unparalleled. Crete is the largest island in Greece and is also home to the oldest wine-producing area in continuous use on the European continent. Crete’s exquisite wines are best enjoyed while dining on traditional Greek cuisine while being surrounded by the beauty of the island. Order a glass of one of the island’s incredible indigenous varieties including Vilana or Kotsifali on your next boat holiday in Greece. Plan a romantic sailing holiday in Crete. 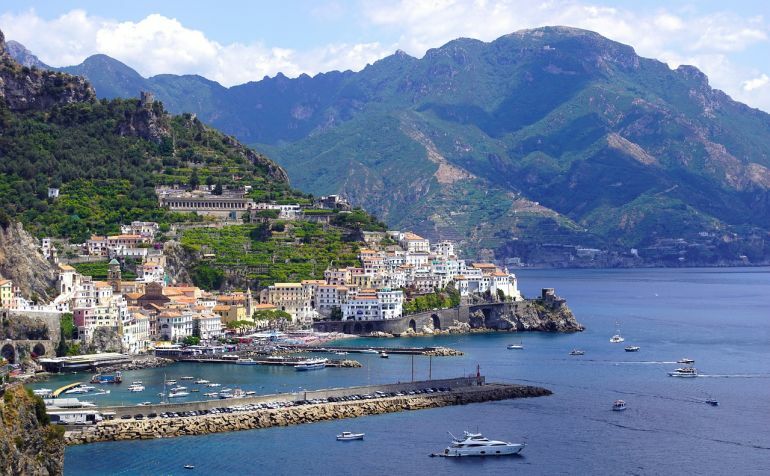 Yachting: the most glamorous way to travel along the Amalfi Coast. The Amalfi Coast was added to Italy’s DOC label in 1995 and has become well known for its high-quality wines. Vineyards are scattered along the steep, terraced slopes that tower above the dazzling coastline, creating an awe-inspiring backdrop that is best enjoyed from a private boat or yacht. Be sure to grab a glass of local wine during an afternoon’s stop at one of the alluring coastal towns situated along the World Heritage designated coast. Don’t miss the distinguished wines of Furore, Ravello and Tramonti and then head out to the glamorous island of Capri, which is famous for both its red and white varieties. Experiences places like these in Ill de Ré, which appear to come straight from an Impressionist painting. Set in the Atlantic Ocean on the western coast of France is Ile de Ré. Also known as the White Island, Ile de Ré is famous for its villages with light and whitewashed houses. The island’s superb wines are distinguished by the region’s unique soil and traditions of winemaking that can be traced back several centuries ago. The charming, laid-back, yet chic, island beckons nature enthusiasts and cyclists who leisurely navigate the island’s bike paths. Spend a relaxing weeklong cruise in France while sampling wines from Ill de Ré’s fantastic vineyards. Follow one of Europe’s greatest wine trails. 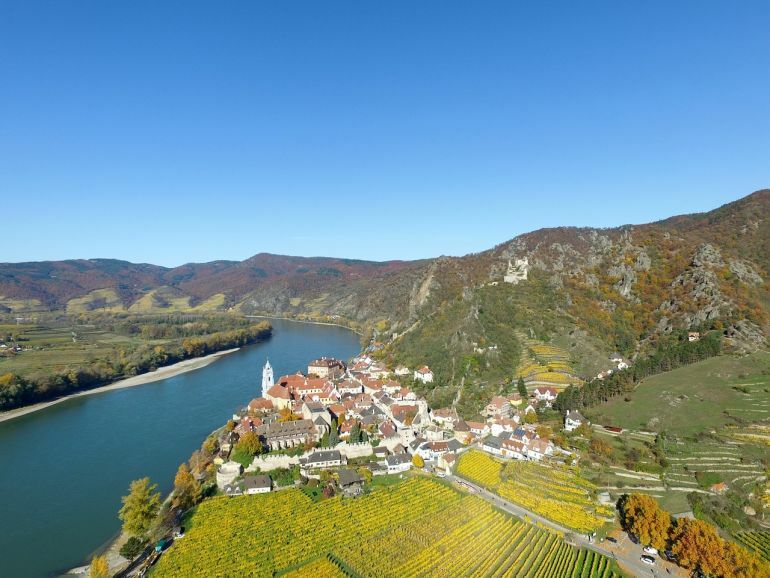 One of the most well-known wine regions in Europe to visit by boat is the Rhine Valley in western Germany. Did you know that winemaking in the Rhine Valley dates back to ancient times? It is believed that the Romans and Emperor Charles the Great were the first to plant vines around the Rhine (thank goodness for that!). A good part of Germany’s 85 km Wine Route can be explored on a relaxing river cruise. Make sure to try a glass of Reisling (which makes up about 80% of the wine produced in this region) while contemplating the inspiring landscapes that define the Rhine Valley. Wondering where to drop anchor on a boat holiday in Greece? 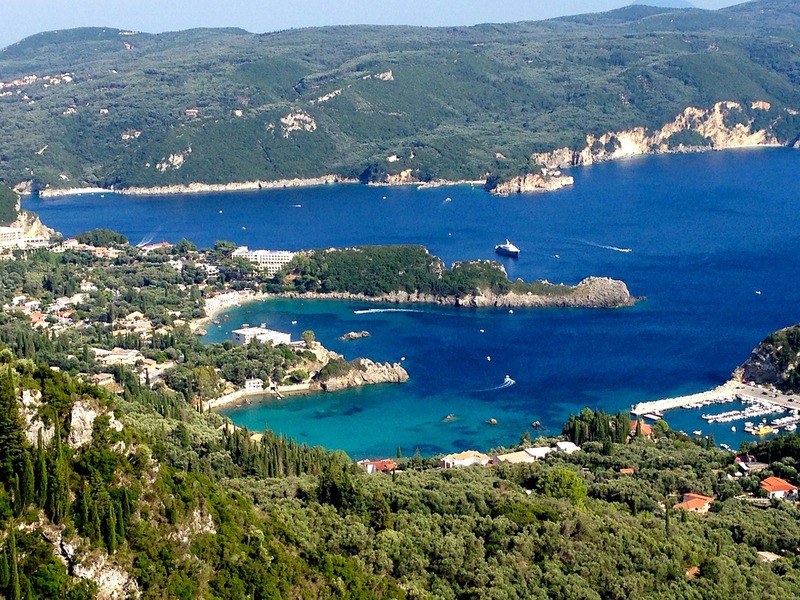 Follow our guest blogger Georgina Moon’s sailing tips for sailing in Greece. The Ionian Islands are made up of 12 fertile islands. We believe (and many agree) that the stunning beaches, ancient monuments and vineyards that cover the Ionian Islands are best reached by your own private yachta. Spend a day sailing along the southern coast of the island of Lefkada, where you’ll find many vineyards offering award-winning whites, reds and rosés in the villages of Athani, Agios, Petros and Syvros. 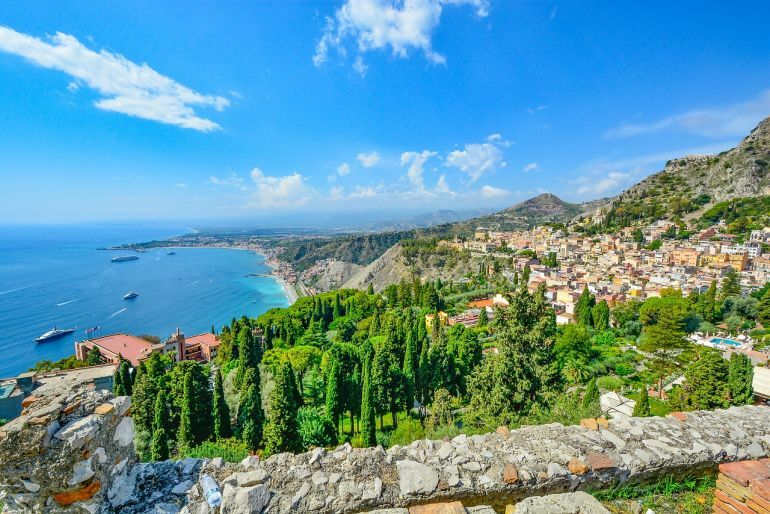 The region’s major wine producers are scattered along the rugged western coast of Central Greece on the islands of Corfu, Paxi, Lefkada, Kefalonia, Ithaca and Zante. These islands are deeply rooted in winemaking traditions that were brought to the region by the Venetians. Today, the wines are experiencing a revival through the adoption of new winemaking methods, an increase of organic and natural wine production and scientific research. Looking for more places to go sailing in Greece? Check out our sailor’s guide here. 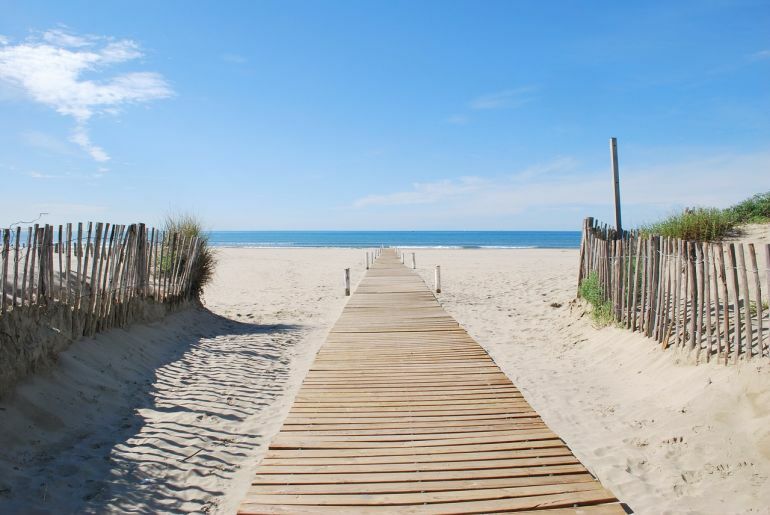 Explore Southern France by boat and enjoy soft, sandy beaches like these in Montpellier before a trip to the vineyards. Situated in Southern France, the former French province of Languedoc Roussillon is characterised by its contrasting mountainous and coastal landscapes, sandy beaches, fascinating cultural heritage and futuristic architecture. It is also (perhaps more affectionally) known for its wine production. Although many vineyards are set further from the coast, Languedoc Roussillon is still a great place to sail and worthy of a mention on our list of the top wine regions in Europe to explore by boat. 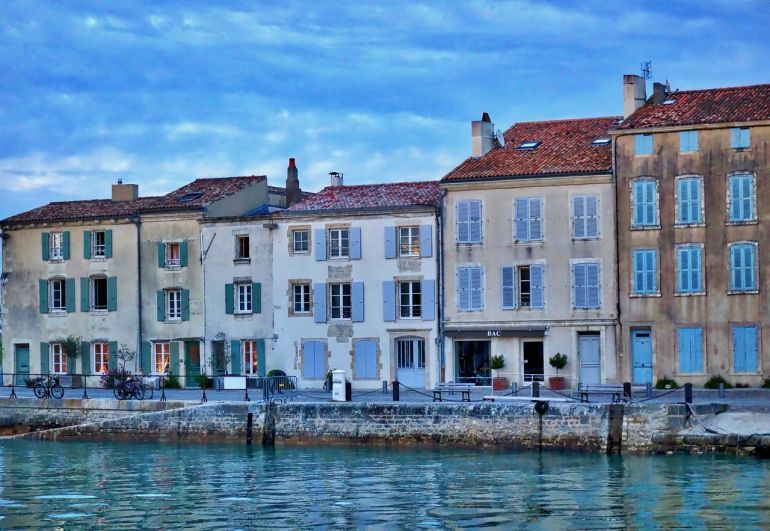 Get more tips for your next boat holiday in France. Experience “la dolce vita” on a crewed or bareboat yacht in Sicily. For many years, Sicilian wines were thought of as a cheap, mass-produced product often used for blending. However, in recent decades, industrial vineyards have been ripped out and a new generation of passionate wine producers have been working hard to reintroduce and promote indigenous grape varieties. The winegrowers’ efforts have been well received and Sicily is now considered Italy’s most exciting “new” wine region and one of our favourite wine regions in Europe to visit by boat. Sicily’s vineyards are spread throughout the island so you will have many opportunities to try the island’s wines every time you drop anchor. Toast with a glass of Nero d’Avola while sailing around the Italian island of Sicily. Make your way up to the countryside while sailing along the Costa Brava from Badalona to sample some great Spanish wines. The mild winters, hot summers, strong northern winds and gentle sea breezes define the wines of the Empordà region along Spain’s Costa Brava. Located in the northeastern corner of Catalonia, the Empordà wine region is about a 30 minute trip from the coast and makes a perfect stopping point while sailing Costa Brava. Empordà is divided into two geographical areas and the region traces its winemaking production back to the times of ancient Rome. Today over 400 winegrowers and 45 registered wineries offer excellent vintages from local and international varieties of grapes. 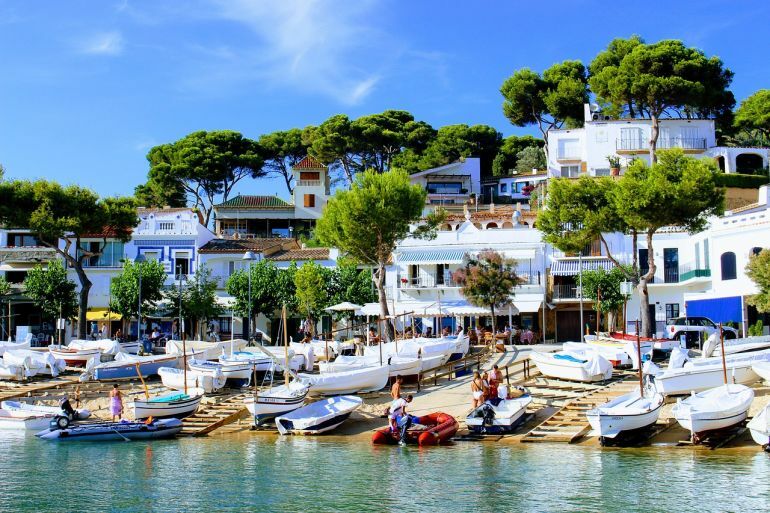 The rugged coast and pleasant rural countryside make the Costa Brava one of the best sailing destinations for wine lovers. For more reasons to go sailing in Spain, click here. Feeling inspired? Start planning a boat holiday with Zizoo to experience the beauty and flavours of the best wine regions in Europe.